OVER the past five years, marketers have only begun to realize the full marketing potential of the eBook as a both free and paid resource. And with the autonomy they provide the author over every element from content to design, this format has many benefits that business owners can leverage to grow their authority without having to concede to the wishes of an external publisher. In this post, we’ll explore the rise of the eBook as a revenue-driving tool, some benefits of the format, and some helpful tools that marketers and business owners can take advantage of to make eBook publishing a little bit easier. 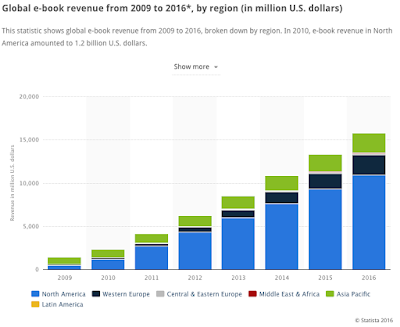 Since 2009, Statista research shows that the eBook format has steadily grown – and in North America, it now brings in more than $10M in revenue annually. In fact, over the span of a few short years, this format has already doubled what it makes in yearly sales. 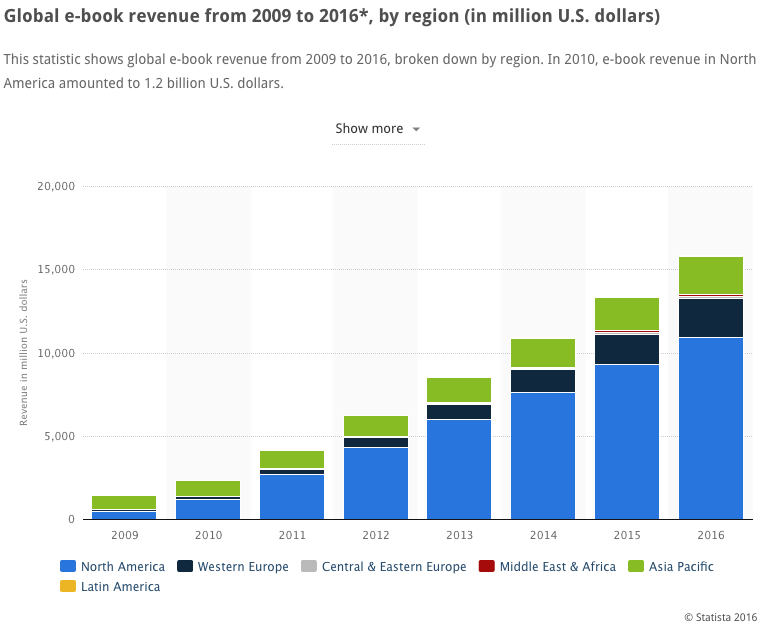 What’s also interesting about this data: It’s clear that North America is still the main market for the eBook, but other markets like Western Europe, and Asia Pacific are catching up, too. So what’s making this format so popular? 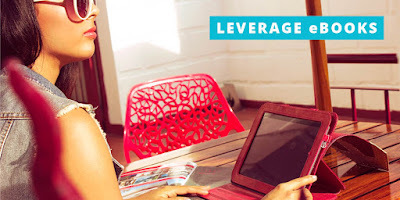 Let’s examine a few benefits of the eBook and see what’s behind this increase in revenue. The eBook is beloved for many reasons, but here are a few of the key reasons readers are drawn to the electronic format. As we become more and more reliant on mobile devices like smartphones and tablets, the eBook becomes even more valuable as it works across multiple mobile devices. In a PDF format, readers can access and read content from any device, no matter where they are or what device they’re using. Readers can pick up from where they left off on a tablet and read on a smartphone. The playing field is far more open when it comes to the eBook format, as anyone can author, self-publish and promote it through their own networks (think social media, email, blog, etc.) Plus, in this format, you can even release an eBook through channels like Amazon with direct Kindle publishing, too. Life is busy, and your readers are constantly on the move. They need a content format that’s versatile and fits their hectic lifestyles–and that can be called up whenever they’re ready for it. eBooks are great for this because they don’t require the modern reader to be tied to the hard-copy format; instead it makes your material portable and accessible on demand. We know that eBooks are great because they’re easily accessible across devices, they open the playing field for authors, and they’re in a portable, on-demand format. Today, we see eBooks in many different use cases. Some writers use eBooks as lead magnets and marketing tools to grow their email lists, while others simply look at them as a way to electronically publish their latest story. eBooks come in many different shapes and sizes, too. Some are short and sweet, while others are long-form novels with more than 70,000 words. The beauty of the eBook is that there’s no rulebook on what the author has to include (or not include) to qualify it as a completed project. Writing an eBook is one thing, but the nuts and bolts behind actually assembling and putting it together are another. Some are intimidated by the design and marketing aspects, and it can sometimes hold writers back from ever releasing their creations. 3D models of your software boxes, DVDs, book, report, magazine, eBook, etc. With a tool like this, you can create a professional eBook cover and other mock-ups for marketing materials without an expensive tool like Photoshop and without having to hire out a freelance designer, all while hoping they share the vision you have in mind. You can write, design, and launch your eBook without ever having to hire out a single external team member–and the entire experience is autonomous. That’s pretty amazing, right? Maybe you’ve already written an eBook, or maybe you’re considering writing your first. Whatever the case–it’s clear that there’s a growing demand for this format, and more and more readers are coming to enjoy the eBook. With smart tools that help simplify the creation and promotion process, you can start writing and publishing more eBooks that leave a lasting impression on the world. What questions do you have about eBook writing and design? Leave them in the comments, and let’s start a conversation where we can help each other out.